Mainframes never die, though their architecture has been eclipsed for years. 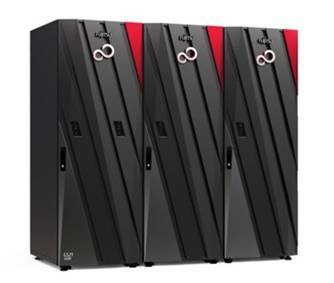 In Fujitsu's case, the GS21 2400 and 2600 mainframe models have become smaller and, we're told, faster and more secure with the arrival of the 3400 and 3600. The GS (Global Server) mainframes are sold mostly in Japan and have roots in Amdahl mainframe designs. They are not plug-compatible with IBM's z14 systems and run Fujitsu software, such as OSIV/XSP and OSIV/MSP, as included in its GS21sx software package. The 2400 and 2600 systems ran v10.0 while the 3400/3600 models run v20. The 2400/2600s use an eight-core CMOS CPU chip, up to four in the 2400 and up to 16 in the 2600. Fujitsu made no mention of any changes in the CPU with the 3400/3600, but did say performance was up about 20 per cent. In a multi-cluster environment, boosted transaction processing performance comes from a reduction in the number of times a system needs to access the System Storage Unit (SSU). Two GS21 3400 clusters can now be mounted in a single chassis, which reduces installation space by about 40 per cent. An all-in-one, single cluster system can also have peripheral equipment installed in the same chassis. The units also have enhanced security, including functionality to prevent unauthorised access through user privileges and operation log management using the SPVM console. An enhanced file transfer function lets them transfer 280GB of data at once to other systems through the XSP OS. Fujitsu has published a new GS21 roadmap, which guarantees continued availability and upgrades for these mainframes into 2030 and beyond. Separately Fujitsu also sells BS2000 mainframes in Europe, based on SPARC processors. The GS21 3400 and 3600 will be shown at the Fujitsu Forum 2018, 17-18 May, in Tokyo, Japan. Deliveries will begin in September and Fujitsu intends to sell 800 of these new models through to fiscal 2020.